The Collide-Safe Anti-Collision conveyor safety switch is a IP67 rated Fail Safe Anti Collision Switch or Emergency Stop Switch. The switch body is made from High Impact UV Stabilised PBT / PC non corrosive material, which is resistant to splash and spillage of most hydrocarbons, mild acids and strong alkali. All external steel fittings are 316 Stainless Steel. The Collide-Safe Anti-Collision conveyor safety switch is activated by pulling the wire rope in any direction or the wire being cut or removed. The wire rope can be up to 50 metres long, depending on the application. The Collide-Safe Anti-Collision conveyor safety switch has a removable Socket assembly, so if the Wire is pulled too far, then the Socket comes off leaving the Switch in a safe and unbroken condition. 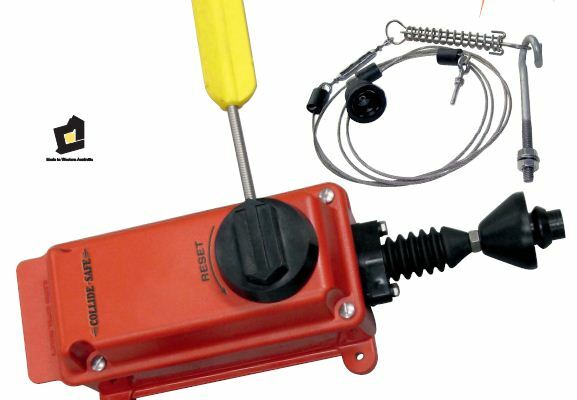 The Collide-Safe Socket assembly has a Tether Point for easy Wire retrieval and Socket resetting. The Collide-Safe Anti-Collision conveyor safety switch is designed to be Fail Safe. The Collide-Safe conveyor safety switch comes with different Socket Assemblies for different applications.